Today also we had a surprise. During afternoon darshan, right after Swami had a short interview with a local couple, the microphone was brought out. Then Swami walked graciously to his chair & sat. A student announced there would be 2 boys from Swami's school sharing their Divine experience with Swami. After graduating with a Masters from Swami's University, in an interview, Swami told Rama & his fellow mate that they will be going to U.S to the Loma Linda University in CA to get a Degree in Health Administration. Swami said first you must get the permission from your Parents & then get back to Swami. Then Swami brought the application papers & asked the 2 boys to fill them out. The form asks why you want to come to this University. In reply, they wrote about the work that Swami does for the people, mentioning the Super Specialty Hospital & many more. They said that after they graduate they will serve Swami at the Hospital. They received a reply from the Loma Linda Univ. saying they were very impressed with what the boys had written on the application form responding to the question about their reason for wanting to attend the university. Therefore, for the first time in history, the university would drop the Toefal exam & they would only need to do the GMAT. The boys were happy to a certain extent, but now they worried over the GMAT. Usually students take a minimum of 3 – 4 months preparing for this exam. 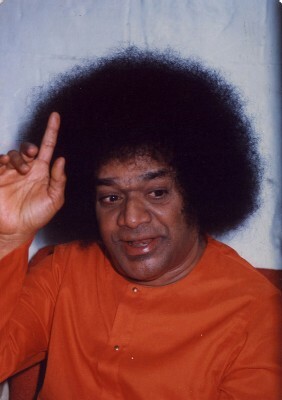 But Swami said, “You need to take this Exam in 9 days.” They asked their teachers to help them study & the teachers said, “Only God can help you.” Now these boys wondered why Swami wanted it this way when they were so happy doing their practice in Swami's University. Why was Swami testing them& putting us through this difficult situation. They took the pre-test 3 times, each time scoring very low. Now they were afraid of bringing a bad name to Swami's Univ. The big day was on a Thursday the 9th. They did the test & were so afraid to click the button on the computer that says, ‘Would you like to see your scores?’ Finally, with sad faces they pressed it & what a surprise! Score is 2400 out of 2600. Then Swami said, “Why you don't trust me? I told you not to worry, that I'm with you.? Swami did the exam for them. The next step was to get the visas to come to US. Then in September, they hear of the tragic moment in New York - 911. (Sept.11, 2002). The embassy is closed. Then Swami said don't worry & told them the date & the time of the day they would get the visas. The Loma Linda University sent an urgent message to the Embassy asking them to reconsider & issue the visas as this was a very special case. The consular apologized to the boys & issued visas on the day & exact time that Swami mentioned earlier. Then Swami brought a suit for boys & said, “When you are in US, you have to dress according to their way, not white pant & shirt like in Parthi." The boys had forgotten to take the suits with them to the US. After graduating in June 2002, they returned home successfully in Nov. 2002 before Swami's birthday. It was another lovely day of listening to our Mother Sai who pours his love on each one of us. As we were sitting inside the Kulwant hall waiting for afternoon darshan we saw the microphone set out. In fact, the microphone was set yesterday too, but there were no speakers. At 2:15pm Swami came – giving lovely darshan to all and then went into the inner room. There were no interviews. As the darshan music (instrumental music) stopped, some of the crowds began to leave. Usually if there is a special event, or a devotee is going to speak, they start by 3pm, not later than that. It looked liked nothing special was going to happen. After sitting for an extra 15 minutes, I thought of saving my spot with a cushion & taking a short break for tiffin. 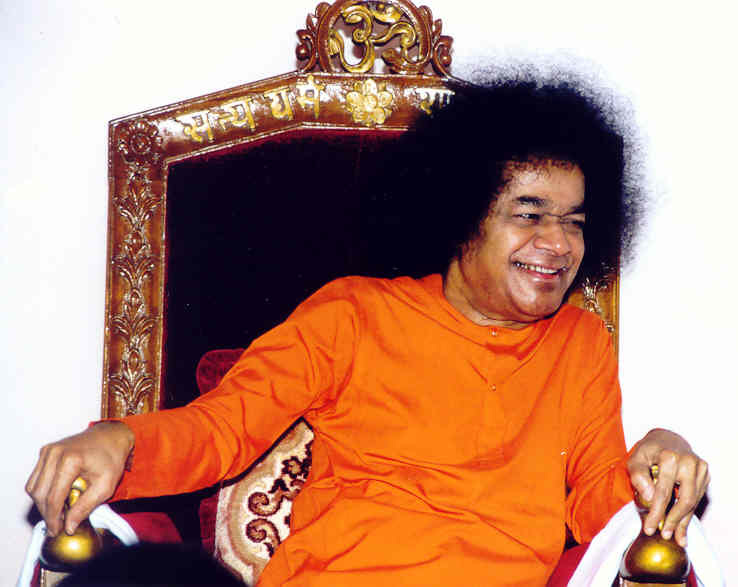 As I walked towards the gate to take my first foot step out, Swami walks to the hall. I felt the calling to stay and not go for tiffin. The old lady said, “Son, my daughter & son in law no longer live with me. Now I'm alone & have to cook for myself. Today I'm having fever & in so much pain & unable to cook. So I thought of starving & just continue to stay in bed.” She was very happy to receive the prasad from our dear Lord. Another student, Sai Krishna, said there was a family in UK. Their wish was to visit Swami in India. Knowing that they didn’t have the income to afford take this precious journey, they began to save a pound at a time. After lots of hard work & saving money for years the big day arrived. Now this family is sitting for their First darshan. Swami comes & says, "GO". They are sitting by the interview room waiting for Swami. Swami came to the boys of this group & said "You boys are coming from UK like Teddy Bears with hairs long up to your noses. See how clean cut my students are. That’s how you should look", and he sent them back to the darshan hall, without interview. Next day when Swami was coming for darshan, Swami sees all the boys in this group are with bald heads. All of them have shaved their heads. Now Swami said, "Why did you shave your heads, I only asked you to have a hair cut not to shave the head?" The boys replied" Swami, if the students can be so close to you with clean hair cuts, how much closer can we be by not having any hair?" Next day at darshan Swami stops by this boy & says, "Hey you – primary student, come.” This boy had his lesson that Swami knows everything. There was a devotee who's a smoker. Each visit he came to Swami was for about 2 weeks. Within these 2 wks he's able to give up the desire of smoking due to Swami's grace. But when he returns home the habit continues. On this particular trip, he happens to stay one month to be with Swami. After 2 wks he no longer was able to control the desire to smoke. So he thought of going outside the ashram to have a smoke & then return. The next day he's back for darshan after fulfilling his desire. Swami walks right to him & says, "You are smoking." He said "No Swami." Swami said, "You are not smoking?" He replies, "No Swami I didn't smoke". Then Swami makes a gentle wave on his hand & materializes a photograph of this boy smoking outside the ashram. During darshan Swami called one Australian group for interview. One devotee looked very sad. Swami asked "Why are you sad". He replied, "Swami my wife is sick & she is in Australia". Swami asked, "Do you want to go home?" He said "yes". Then Swami points to the interview room wall & says, "What do you see on the wall". Swami has created the map of Australia on the wall. Swami points to the map & asks, "What do you see now". He says, "That’s my city". Swami asks, "What do you see now". He says "Swami that’s the street I live". Then Swami says "What do you see now", "That’s my house Swami". Swami shows the entrance door to his house and asks, "You want to go in?" As he said, "yes" Swami said, "go". So this devotee takes one foot inside the door (thru the interview room wall) & finds himself in Australia. The rest of the group members are stunned not knowing what happened to their fellow group member. This was a group of 12 devotees that went in & coming out of the interview room with 11 devotees. As they began to worry thought of calling Australia. He picks up the phone & says, "YES I'm in Australia", & clears the confusion. As the student was just about to end these lovely stories, Swami surprised him by asking to sing a bhajan. The student was breathless & there was a 5-minute pause. Then he calmed down & said that Swami has requested me to sing a bhajan & I would like to take this moment to think, so I can sing an appropriate bhajan that will express my feelings. He sang a short bhajan in Hindi.